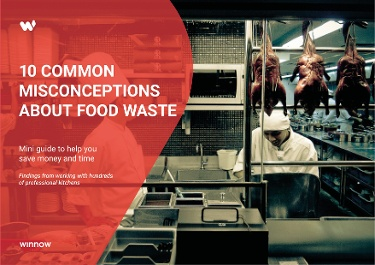 Since launching in 2013 we have worked with hundreds of Food & Beverage professionals from all over the world helping them cut food waste in half while saving them time and resources. They have the incredibly important role of linking both the kitchen and front of house, to make sure industry’s safety standards are met, while customers get products that meet or exceed their expectations. We had the pleasure to interview Nigel Moore, Vice President Food & Beverage Asia Pacific at AccorHotels, to learn more about his journey, inspirations, and challenges. My first job in hospitality was collecting glasses at the local golf club bar. From there I had the opportunity to travel and spent 9 years in Switzerland working firstly as a dishwasher and then moving up each season to a higher position. I went from waiter, to chef du rang, and then from assistant to bar manager, and Maître d'hôtel in various 4 and 5 star hotels. I really enjoy the fact that I get to travel to some of the coolest cities and resorts in the world. However, the most satisfying aspect of my position is to see the growth and career advancement of my team members. It is so rewarding to see junior team members grow through the ranks to then head up managing some of the largest business units we have in the company. I have been a mentor to a number of these team members and the satisfaction I get, can not be measured. What role does F&B play within Accor’s growth strategy? Since the acquisition of Fairmont Raffles Swissôtel Hotels & Resorts last year, F&B has taken on an extremely important aspect of Accor Hotels growth strategy, especially in the luxury segment. What do you believe are the hottest industry trends for 2018? How can AccorHotels be a trendsetter in F&B in the Asia Pacific? At Accor Hotels we focus more on secular trends. These are more relevant to us than cyclical trends that change from market to market. What are the differences in the Asian culinary scene versus Europe? There are a couple of main differences. The first one is the quality and availability of seasonal organic products. The mindset and infrastructure of the European agriculture business allows for more products to be available at the right price point. In Asia, the mindset of this culture is only just taking shape. The second difference is that in Asia, F&B business is still not seen as a professional business which results in a lower quality of professional services. With its Plannet 21 programme AccorHotels has shown that places a high importance on shaping a sustainable future. What initiative have you launched since the latest version of the programme was launched in 2016? With the acquisition Fairmont Raffles Swissôtel Hotels & Resorts we are now rolling out the Planet 21 program across all levels of luxury business units. At the recent AccorHotels’s F&B conference hosted in Bangkok a whole segment was devoted to the importance of the program. We now have more focus on food waste, in all aspects. We are writing smarter shorter seasonal focused menus. We have run several programs which focus on cutting down the amount of food that guest traditionally pile onto their plates and then leave in our buffet restaurant. Also, we are working more closely with Humane Society International to purchase free range eggs, and we have excluded six endangered species of wild fish from menus. In addition to that, we recently started a campaign on the reduction of no glucose-fructose syrup, just to name a few. What was the immediate impact when you first had the Winnow System installed? Have you had any feedback from the chefs? After Winnow was installed we noticed that all teams see the value in the system, and we see a positive impact overall. Not only in terms of reducing food waste, but also a positive impact on productivity, better quality menus and produce, decrease in waste disposal and savings from energy bills. What other innovations would you like to bring to AccorHotels’ restaurants? It would be ideal if we would focus more on technology, and especially in the use of technology to increase efficiency. What would you say to other hotels considering a food waste reduction program? Just embrace it. Simple as that.